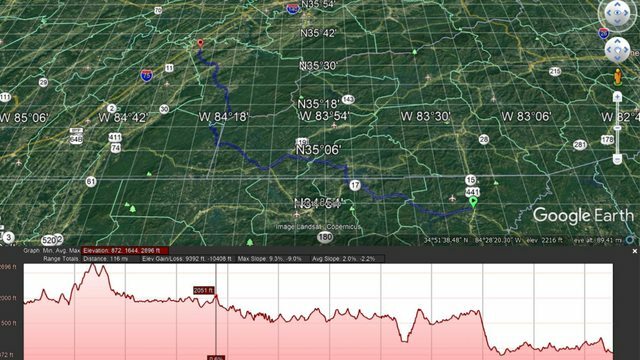 Planning to go basically NNW from Clayton, Ga. to Sweetwater, Tn.I know, according to the map, that some of that area is mountainous but was wondering if there are steep grades. I don't mind mountain driving but try to avoid long, steep climbs and descents. If you know the area, will appreciate your response and advice. Get the Eastern Mountain Guide. Shows the grades on all the truck routes. Also, Google Earth has an elevation feature. Set a route and right click on the blue line. Select elevation. You can cursor along the elevation and see on the route where the highest pass and steepest grades are. Here's what your route looks like. The Elevation Profile on Google Earth is great. As you can see, there are a couple of steep grades along the way but none of them are very long. That top red box shows the actual elevation so you can scroll along the route and see exactly what's ahead on the trip. The route above is what I’d use taking 294 to 68. Both of those are a little narrow in places and if there is additional paving on the inside of the curve slowdown as it will be a sharp turn. No long climbs or decents. HWY 68 is the scenic route through that part of TN. It is a great road altho it is narrow at times with a few curves. Really a nice drive, with lots of sights along the way. We drove HWY68 many times in our RV since we own a cabin that fronts on HWY68 in Coker Creek, TN. Nothing of anything to really worry about. Yes there are some grades but nothing bad. I think you would be more concerned with tighter turns off the main highways. with a gasser, you should hot have any problems.. Sure you won't run up and down hills at or above the speedlimits, but we have driven all over eastern tennessee and further north with no problems. Just don't push it too hard, and let it shift down and do its thing. We have gone across from west to east and back several times, I-24, I-40, and a lot other small roads, with no difficulty. But if the road changes from pavement to gravel or dirt, start looking for a place to turn around. Those hills are a lot harder to back down than drive up. IF you are planning on running interstate highways most of the way. Be advised. Interstates have a Max grade of I believe 7%. So you should never see anything steeper on the interstate. And on those max grades they have a slow lane up, and down. Do remember going up is much easier than coming down. Be sure to gear down, let the engine do most of the braking, EVEN if that means going all the way down to 1st, or 2nd gear. Come down slow. You will be fine. I believe that is true of the East. Some of the Interstate Highways out West can a little steeper than that.